Public spaces and urban cultures need novel impulses for our contemporary life. Those impulses ask for research-driven strategies based on both creative and analytic methodologies in mapping and analysis. The objective of Spatial Practice is to work with intervention and research units where professionals and students from the domain of art, architecture, and public space design are able to develop novel solutions and creations through interdisciplinary dialogues and agonistic negotiations. Interventions could vary from radical architectural fiction, artistic intervention, to experimental practices in public inside and outside spaces. What is the "new normal" in our Google Glass era to come? 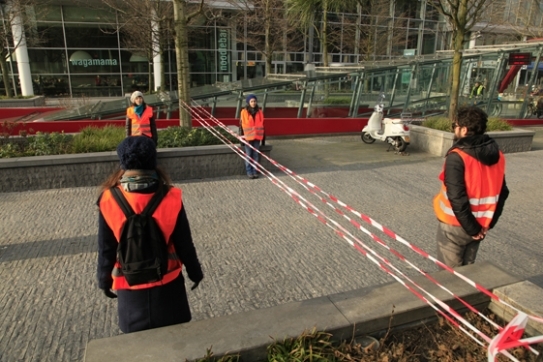 How do conflict and control play a role in public spaces today? How to deal with current forms of vacancy, abandonment, and shrinkage? The Spatial Practice curriculum departs from student project proposals; topical issues; and specific, relevant subjects.